The Declaration of Sentiments and Resolutions of 1848 was modeled on the Declaration of Independence and was the founding document of the American Women’s Suffrage Movement. It was the first document in history to call for granting women the right to vote. Montanans passed the Suffrage Amendment to the Montana Constitution in November 1914, six years before the passage of the 19th Amendment to the U.S. Constitution. 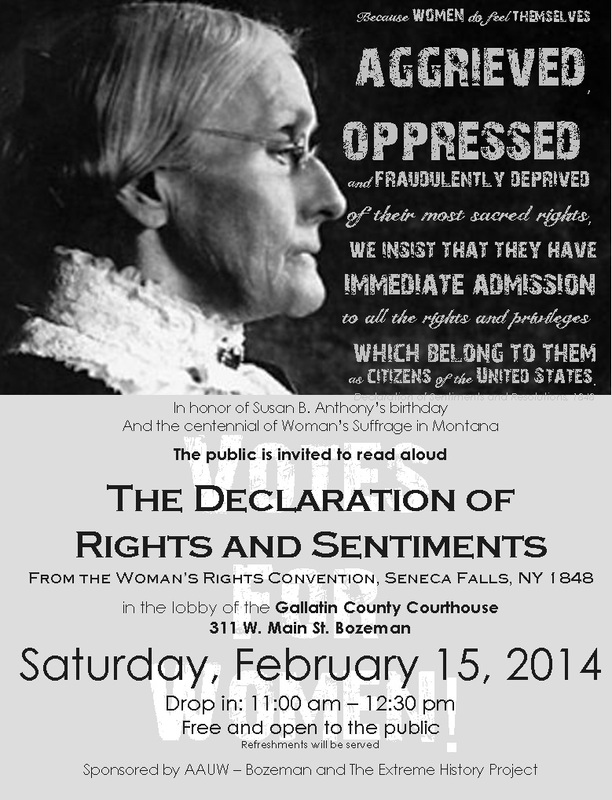 This public reading honors the women who wrote the Declaration of Rights and Sentiments and begins a year of activities commemorating the 100th anniversary of the passage of the Suffrage Amendment in Montana. Do you mean Feb 15? Thanks for the catch. Yes, its February 15.